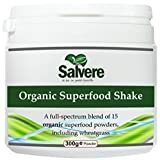 Organic Superfood Shake is a 100% organic (Soil Association registered) superfoods powder, that can be used as a plant protein powder, light meal shake or daily nutrients booster. In fact, it is one of the most nutrient-dense organic superfood combinations per serving you will find. It provides a broad range of vitamins and minerals, antioxidant and powerful phyto-nutrients through its multiple organic superfood, superfruit and herbal ingredients. High in vegetable-source proteins, this full-spectrum blend also contains over 20 natural enzymes and 70 beneficial nutrients. A great all-round supplement to support energy levels, detox cleanse, and alkalise the body – daily organic nourishment made easy! Organic Superfood Shake contains VITAMINS including vitamin A, vitamin B complex, vitamin C, vitamin E and vitamin K. MINERALS including iron, phosphate, boron, copper, selenium, calcium, magnesium, potassium, chromium, manganese, phosphorous, silicon and zinc. A high protein powder that support healthy digestive enzymes, increase energy levels, and boost immune system. Salvere Organic Superfood Shake is Made in the UK and produced using certified GMP(Good Manufacturing Practices).